Give yourself some extra storage space to keep things safe and secure from the bad weather, locked away from thieves or just to keep your items organised and tidy with the fantastic, 6′ x 6′ Traditional 6′ Cabin Shed. This is a shed with a very modern style and thanks to the four large windows will allow plenty of light inside so you can easily see all of your belongings. So that you will not have any problems getting in and out a large single door has been used for access. The idea of this shed is that it will provide you with an area to store your items, but it does not require a huge space in your garden. This is a shed with a really good look, but it also is made with some top quality materials to make certain this is a shed which is going to last. Thick tongue and groove cladding is joined by solid roof and floor boards to really make this a durable structure and the thick framing will make it so the shed can take anything the weather or the kids than throw it’s way. The apex roof will give you more than enough headroom all the while not allowing any rain inside. 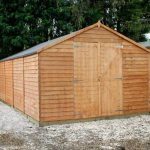 The 6′ x 6′ Traditional 6′ Cabin Shed is a fantastic shed which has a very pleasant appearance and also offers a very good amount of room for storage. This is the type of shed that would just be perfect in a garden where space is something of a premium and the last thing you want is a huge shed taking over the space that you do have. Inside the shed, you notice right away that there is more room inside here than you would have thought. Both the width and the depth are right around 6 feet so you have a great box shape to make use of. There is also a very generous amount of height in the shed with the ridge being 7 feet 1 inch high and the eaves being 5 feet 6 inches. We really appreciate this kind of headroom as it makes moving around inside the shed not uncomfortable. We really do like the apex roof on here. Not just because of the headroom it provides you with inside, but because of the protection it gives you from the rain and snow. This is one very well designed roof, made with 12 mm tongue and groove boards and covered with some high quality felt to really ensure it is waterproof. Using 12 mm tongue and groove shiplap cladding was a great design choice as it offers a very good look, but it is also very practical in that this type of cladding is some of the very best when it comes to keeping water out. Some very impressive and strong redwood has been used to make this cladding and in general we are very pleased with how strong it feels and how amazing it looks. We really were very impressed with the frame that was used inside here. Like the cladding, redwood has been used as it is very strong, but what surprised us about this frame was the fact it was a 44 mm x 27 mm frame. This offers the shed just such an incredible set of bones that are going to stay very strong for lots of years. The edges of the frame have been rounded off which gives the inside of the shed a very classy look. This is a very durable frame and we feel it offers all you need, but they do say they offer a heavy duty frame as an extra. Made with redwood and done in the same style as the roof boards, 12 mm tongue and groove boarding has been selected to make sure this floor is very durable. We have no idea what you plan on storing inside here, but we are certain this strong floor can take whatever you want to put on it. Bikes, tools, workbenches and pretty much anything else you could think of would be fine inside here. To make sure the wood is safe during transit the 6′ x 6′ Traditional 6′ Cabin Shed will be dip treated, but they do say, you should treat it properly within six weeks. 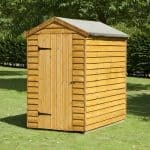 Honestly we feel this is too long and the sooner you can give this shed a generous wood treatment covering the better. 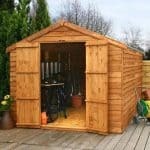 To really ensure a long lasting shed, you will need to give it a fresh coat once a year. The shed comes with a one year warranty which will protect you in case something does go wrong with the materials in that first year. While the warranty is good, we think it would be very unlikely for any problems to occur. We have a great sized, 5 feet 9 inches high, 2 feet 6 inches wide door on here which will make putting things in the shed and taking them out for use no problems at all. The door is held in place very securely by three door hinges. Top open and close the door we have a very solid handle which also has a very nice look to it. There are four windows on the shed with two on the front and then one on each size. These let in plenty of light and they do make the shed feel more friendly and inviting. These are very high quality windows and rather than use styrene like most other sheds do these days, horticultural glass has been used instead. As standard these are fixed windows, but the 6′ x 6′ Traditional 6′ Cabin Shed actually gives you a couple of options when it comes to the windows. First of all, you can choose to have no windows at all or if you would like you can pay an extra, £31.99 to have one of the windows be a window that can be opened. 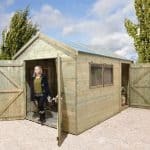 This is one very solid shed and one thing we love about it is how it actually comes with a proper door lock so there is no need to buy a padlock or a pad bolt as the door lock alone will keep this shed tightly locked up in the evening. With four rather large windows this is not the most private shed out there, but to be honest this is not a huge deal as a set of blinds or perhaps some fun looking curtains can make the shed more private for you. One way we always think is ideal to give a shed a bit of your own personality is by picking a wood treatment that is a colour you love. The choice you have when it comes to wood treatment is pretty incredible so we are certain there will be a colour which really catches your eye. There are a couple of extras available with this shed. To start with depending on the type of surface you are building this on, you may be interested to know that there are some wooden floor bearers which can be added for a cost of £27.99. You will also have noticed the veranda in the picture well this is another extra that you can look into if you think it makes the shed look good. From the thick cladding to the impressive frame this is a shed which is quality through and through. 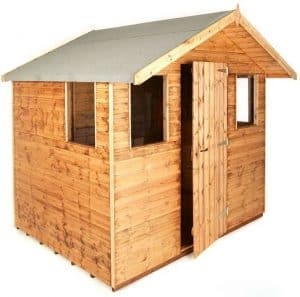 We love how with just a minimal amount of care and a yearly coating of wood treatment, how this is a shed which is going to be with you for a number of years. 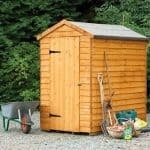 Look we have seen sheds that offer far more storage space, but this is a shed which is made for smaller gardens. We do think that if you plan your storage well enough that you can really make the best of the space available. This is a two person job and by following the instructions properly, having ice cold Pepsi on hand and also having some good music playing on the radio, we see no reason why this will not be built relatively hassle free in a couple of hours. This may be over £500, but you are paying this because of how high quality and long lasting the materials are. Final Thoughts: We are positive that the 6' x 6' Traditional 6' Cabin Shed is a structure which is going to look fantastic in your garden. 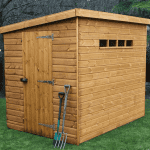 Even if you buy the standard version with the fixed windows, you are getting a great looking and very practical shed which is going to enable you to keep your items safe and dry. The shed has a very appealing type of design which we feel will work in pretty much any garden it calls home. 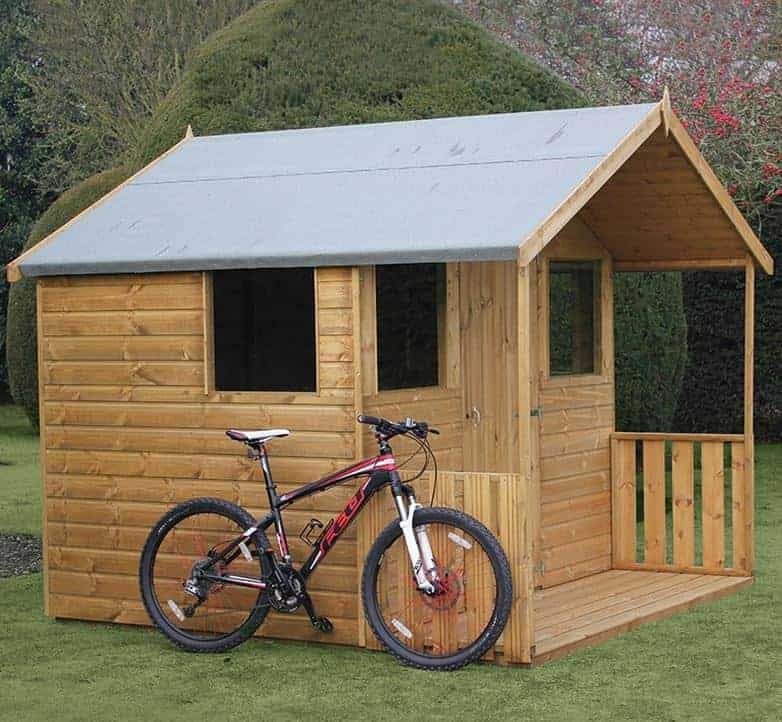 If you do lack a huge garden, but need a place to keep things tidy then we think this is a shed which would fit your needs perfectly.